Today, Feb 26th 2014 is Pink Shirt Day , which is a cause to fight bullying. Having been a constant victim of bullying (mostly of a homophobic nature) throughout most of my elementary and high school years, I know too well how serious bullying is and how the consequences of it can leave permanent mental and emotional scars, beyond all physical scars from being beaten up. Indeed, it’s the verbal and sexual harassment that damages a person for years to come, not the bruises they get on their skin. This stuff cuts far deeper. These wounds take a long time to heal, and it makes it hard to regain trust in other people, to allow yourself to go out into social venues and to interact on social media online when there is always the threat of being subjected to bullying and homophobia even (and now, especially) on the web. For just $10L you can get a mesh t-shirt, male or female version, at PurpleMoon mainstore right now to show you won’t stand for bullying in any form and the proceeds go to CKNW Orphan’s Fund in support of Boys & Girls Clubs Anti-Bullying programs. I’d also like to mention while on the subject, there is an inworld anti-cyber bully organization called Stand Tall, you can search it in groups. I had spoken out against cyber-bullying last month on my facebook, and for it I got my facebook disabled (reported for having a “fake name”-avatar name by the bully I was exposing) and so did the FBs of others who had shared their experiences with the perpetrators. But I created a new one, and showed the bullies that neither I nor anyone else who spoke out against such behavior on my FB will be silenced. On a related note, Fashion Pride, a 2 week event celebrating sexual and gender diversity is coming soon, March 10th! I’ll be modeling and blogging for this fab event organized by Second Pride and Babylon Modeling agency, and to show my pride I’m wearing these rainbow earrings I’ve had for ages. 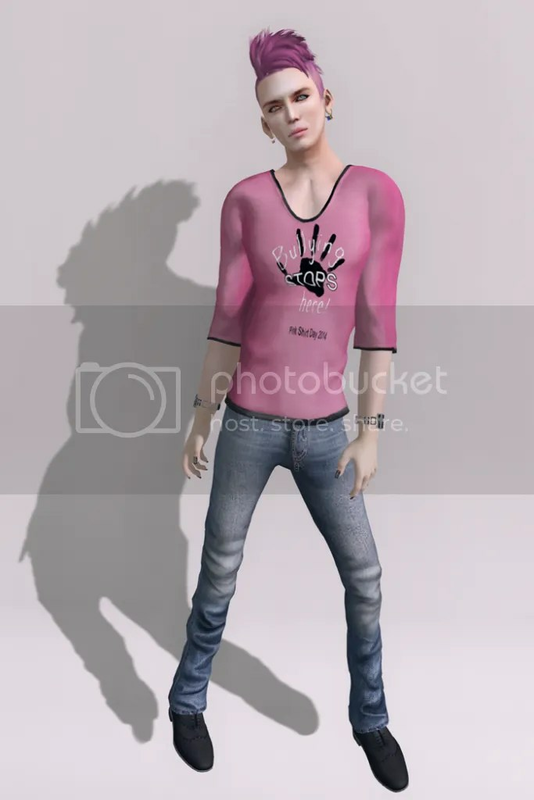 This entry was posted in Uncategorized and tagged "Pink Shirt Day" "Anti-Bullying" "PurpleMoon" "Dura" "KMADD" "MADesigns" "Amarelo Manga" "Digital Aura" "IspachI" by Paradox Messmer. Bookmark the permalink.